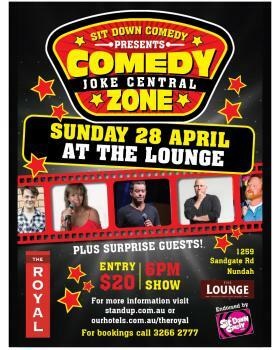 Live stand-up comedy is flourishing in Brisbane; and what better way to show it than by putting on a new, regular show in The Lounge at The Royal, Nundah! Welcome to the Comedy Zone! The Sit Down Comedy Club, (Brisbane’s #1 Comedy Producer) has put together a show that not only features some of Brisbane’s BEST standup comedians, but also provides an opportunity for some fantastic new acts to really develop their skills! And for the extra cherry on top of this already amazing comedy sundae? Each show will also feature some surprise special guests – and who knows? You may even recognise some from the tele & radio! So let’s hear it, Brisbane… are YOU ready to enter The Comedy Zone?